Guess what guys? That's right, 4 years ago today, on the 02 August 2001, this SK.net forum was born. Many things happened since then, and I think this board allowed the international Berserk community to progress a lot. So happy anniversary to all members, let's all party in the chatroom! I'm really proud to have been a part of it Great job, everyone, for keeping this a great community. Happy Birthday ...the forums here rock....other forums on other sites, pale in comparison...LONG LIVE SK!!!!!!!!!!!!!! !!!!!!!!!!!!!!!! Cheers SK.net! Thanks for the 4 years of Information, Entertainment, and Memories of Everything in between. Encore, Encore!! Happy birthday, SK.net! 4 years? wow! I hope we will do the same thing in 40 years. cheers to the community and thanks to y'all. Happy anniversary! I visit lots of forums, but this is easily one of my favorites. If I had any talent, not to mention the software, I'd make some kind of movie comemorating all best and worst moments of last year. Since I don't have the capacity though, perhaps somebody else should (hint hint). And great job though JIN, that picture is hilarious. Simply awesome drawing, JIN. 4 years? Christ. Here's to 4 more. Thanks to Walter and to all the admins and everyone else who makes this place what it is! Woooo Happy BDay SK.Net. I know this board is one of the reasons I am able to keep up with everything, thanks goes to the admins and owners!! Well, there was Griffith's trip to the future, complete with predictions about Berserk volume 62, released July 6, 2020. I don't have anything nearly as cool as what Jin posted (unless Griffith has no objections to me posting his time-travel discoveries), so I'll just wish everyone a happy anniversary! Even if he objects ( ), here's the cover of volume 62, and it has never been so true. Thanks Aazealh, this is even better because I didn't have that picture saved. It helps give the full effect. i know its a few days late, but happy B-Day to SkullKnight and congrats to Wally and everyone else that has made this the best Berserk site out there. I remember that pic ! Was that created before the bersek armor showed up? Was that created before the bersek armor showed up? Its been a while. Yep, more than a year before. Wow! its been quite some time! I think a little past 2 years since I started to visit the boards! Awesome job to the people who were well before me and contributed a lot more then most of us! You have taught (hopefully) many other Berserk fans out there some valuable knowledge! I know I am grateful! 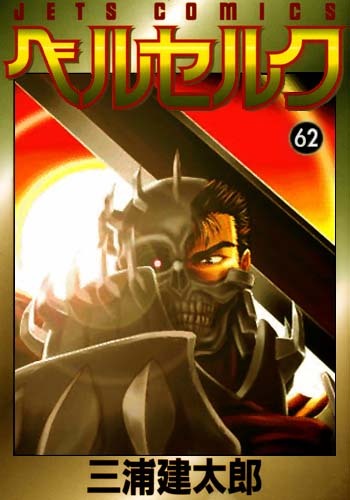 Is that after guts and Skull knight merge their powar? Anyway, that pic is awesome, thanks for reposting it.